Gavin Extence was born in 1982 and grew up in Lincolnshire. As a youngster, he was a keen chess player, winning several national titles. He began writing his first novel after he had completed his PhD in Film Studies and was unable to find employment. The Universe Versus Alex Woods tracks wilful teenager Alex, whose fascination with science and astronomy came about after he was put into a coma by a falling meteorite. When he breaks a window in next door's greenhouse, his mother insists that he offers to help out his elderly neighbour. A remarkable friendship develops between the youngster and the reclusive Mr Peterson, Vietnam veteran, amputee, dope smoker and dedicated fan of Kurt Vonnegut. His second novel, The Mirror World of Melody Black, is about the fine line that separates normal from not - and how life can spin, very swiftly, out of control. You can. read the first chapter here. In his latest novel, The Empathy Problem, now out in paperback, ruthless hedge fund manager Gabriel unexpectedly, and much to his disquiet, develops a conscience. Exclusively for Foyles, we talked to Gavin about his unusual take on the redemption story, the Occupy movement and being drawn to subjects that have an element of humour implicit in them. Below that, you can read an earlier interview, about his first novel The Universe Versus Alex Woods. 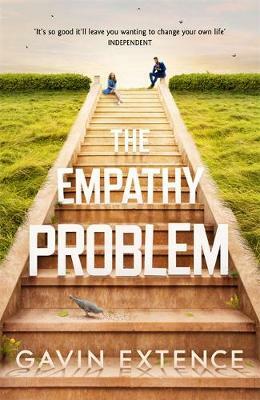 The Empathy Problem is an unusual take on a redemption story – what was the inspiration behind it? I think I originally envisaged the story as A Christmas Carol but with brain cancer instead of ghosts. The protagonist, Gabriel, is a sociopathic hedge fund manager who develops a tumour in the ‘emotional centre’ of his brain; essentially, he grows a conscience. The twist is that he’d much rather stay bad – he finds the feelings he starts to experience (empathy, guilt, love) extremely inconvenient. For me, there was a wonderful mixture of drama and dark humour implicit in this set-up: an awful man who’s redeemed in spite of himself. Do you think it is the tumour that makes Gabriel a better man or was it finding Caitlin? It’s both, but the question’s more complicated than that. Really, it’s a variation on the endless nature/nurture debate. In the beginning, Gabriel is certain that his ‘problem’ is purely medical, but he’s far less sure of himself after he meets Caitlin. It’s fair to say that she’s the first person – other than himself – he has ever cared about. But I think it’s best left to the readers to decide where these feelings come from. My main hope is that the love story is as weird and unconventional as the redemption arc. In The Empathy Problem you confront a lot of political issues surrounding the Occupy movement; is it safe to say that you were pro-Occupy? Yes, absolutely. The financial crisis laid bare all the worst things about our economic system, and I think Occupy expressed the anger that many of us felt – and still feel. The idea of the 99% was very powerful, and it got to the heart of the matter in a way that a lot of mainstream debate, especially in Westminster, did not. A rich minority crashed the economy – while amassing obscene, predatory profits – and then the poor were made to pay for it. We have to be completely clear on this point, because the fallout is ongoing, and unless people speak out, inequality is just going to grow. Lots! Fortunately, Occupy London is a very transparent organisation – the minutes from every meeting they’ve ever had are available online! – so there was plenty of information to do with day-to-day concerns, logistics, decision-making and so on. Then there’s the mountain of contemporary news reports and footage, video diaries, blogs, first-hand narratives . . . Research is like an iceberg: nine tenths of it stays submerged in the finished book, but you really do need it to support the part that’s visible above the surface. Dr Barbara has cropped up in your novels before! Will she ever get her own novel? It’s unlikely. But she’s a really useful secondary character, since she’s a psychotherapist and all of my books seem to involve malfunctioning brains. It was interesting revisiting her in The Empathy Problem because her relationship with Gabriel is very antagonistic. She challenges most of his preconceptions, and he hates this. Your books are always very personal, do you have a particular connection with any part of The Empathy Problem? It’s a difficult question to answer! In one sense, this is my least personal book – about the only connection I can draw to it is that I was unemployed and impoverished at the time of the Occupy protests. I can remember watching them on TV, during winter, while huddled under about five blankets because I couldn’t afford to run the heating. But I suppose that’s part of the point of this book. A huge number of people were affected – saw their hopes and prospects diminished – by the financial crisis. It cast a shadow that hasn’t gone away. More broadly, I think there’s a lot of me in this book in the sense that it expresses some deeply held convictions. To be honest, I don’t see the point in writing about a subject if you’re not passionate about it! While all of your novels tackle serious issues there’s a strong element of humour in each: is it hard to keep this balance when writing? This isn’t something I’ve ever had to think about too much. It’s the way I naturally write. A huge part of becoming a fiction writer is figuring out what works for you. When I started, I had this preconception of the sort of book I ‘should’ be writing – and I ended up writing like a very, very poor imitation of Ian McEwan. Seriously, it was awful! It was only when I relaxed and found my own style that my fiction came alive. I think this is true of everyone. You see the world in a certain light, and this is what you need to translate to the page. I also think I’m naturally drawn to subjects that already have an element of humour implicit in them. The world of high finance is no exception. Much of it already feels like satire. Many authors say they have a set process when it comes down to writing, do you have any rituals that help you to write? Not so much any more! 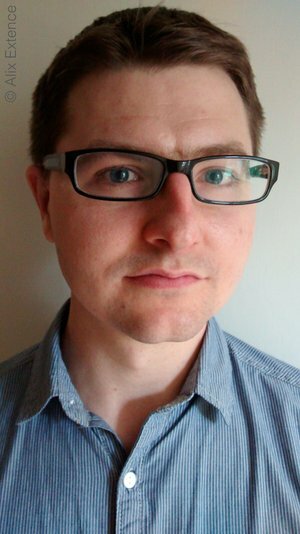 I used to be really regimented about writing – I wrote Alex Woods as a nine to five. But then I had children and I had to adapt. Now I just write when and where I can. I wrote half of Melody Black between five and eight a.m. because this was the only time I had available to me. I wrote a lot of it on trains. About the only thing that has remained constant is that I always write my first draft long-hand. I find a pen and paper far more inspiring than a blank computer screen. But really, this is just another example of figuring out what works for you. I think that’s why so many authors have a process. It’s just a case of trying to swim with the current. Below is a previous interview with Gavin Extence on his first novel, The Universe Versus Alex Woods in which he talks about getting to the heart of an unlikely friendship, the limitations of writing about what you know and the similarities between Kurt Vonnegut and John Irving. The friendship between Alex and Mr Peterson is fantastically drawn and steers clear of cliché but, in an age where relationships between children and adults are viewed with suspicion, were you concerned about how it might come across? I always knew that the friendship between Alex and Mr Peterson was going to form the heart of the novel, and I knew that I had to get it just right to avoid it appearing a) implausible or b) sinister. So there were a few key decisions I made early on to counter these problems. First, I knew that the relationship had to have a father-son (or grandfather-son) aspect which would go a long way to naturalizing it. Alex has never known his father, Mr Peterson has no children, and in a way, this suggests the basic need that their relationship fulfills. At the same time, I wanted theirs to come across as a genuine and believable friendship of equals - and for this, they had to have more in common than is immediately apparent. Alex and Mr Peterson are both outsiders, both are socially isolated, and both have been physically and mentally scarred by events in their pasts. Added to this, both are highly unusual characters - and I think this is another thing which helps the reader buy into their atypical friendship. One of the challenges, and great joys, of writing these characters was making their relationship appear natural when, at first glance, there is so much there that shouldn't work. Alex is a very bright boy but very unworldly. Is this why you chose him as the narrator? I loved the contradictions in Alex's character, and in particular, the mixture of naivety and academic intelligence. Alex has the capability and desire to understand the world on quite a deep level, but he's also an innocent in lots of ways. Consequently, I think his voice brings a real freshness to the narrative. In general, I'm a big fan of teen narrators because they tend to have this dual perspective that comes from having one foot in adulthood and the other in childhood. Adolescence is really the point at which you start to form your own opinions about morality, religion, politics and so on - and having Alex as narrator allowed me to tackle a lot of big, important issues in (I hope) an accessible and unassuming way. Kurt Vonnegut is alive and well in Glastonbury or at least his spirit is. What made you chose him as the ghostly presence in the book? And is Mr Peterson really Vonnegut? Breakfast of Champions was the biggest influence when I started writing, because it just has this incredibly odd (and incredibly funny) way of looking at the world. There were aspects of Vonnegut's voice - the quirkiness, the inclusiveness, the informality - that I knew I wanted to capture in Alex's narration, and then, somewhere down the line, it occurred to me that a shared love of Kurt Vonnegut might also work really well as one of the cornerstones of Alex's friendship with Mr Peterson. Kurt Vonnegut always enjoyed a huge, cross-generational appeal, and for Alex his writing is a springboard for thinking about the state of the universe in ways that otherwise might not have occurred to him. As to any similarities between Kurt Vonnegut and Mr Peterson, there are probably several - their political beliefs, atheism, experience of war, etc - but there are differences too. Kurt Vonnegut was a very warm and gregarious man, whereas Mr Peterson, at the outset, is several shades grumpier, and much more insular. Meteorites, marijuana factories, abduction and euthanasia: that's a lot to tackle in a first novel. Did you ever feel that you'd bitten of more than you could chew? Yes, at times. But I've never been a fan of the 'write what you know' dictum, which strikes me as offering a very limited scope for a first novel. For me, one of the great pleasures of writing fiction is that you're free to go wherever your imagination takes you. It probably helps, too, that I have a background in research, so I wasn't intimidated by having to find out about subjects in which I have no specific expertise. Euthanasia is an immensely controversial subject and highly divisive. Why did you feel you wanted to tackle this topic? Oddly, I didn't set out to write about assisted suicide. My starting point was Alex. I had the vague notion, early on, that I wanted him to do something unconventionally heroic; and although assisted suicide is a highly divisive topic, I'd like to think that Alex's heroism still stands regardless of the reader's personal views. After all, his actions are almost entirely selfless: he sacrifices his own wishes to help fulfill someone else's, and is willing to face whatever consequences follow. More broadly, assisted suicide is one of those issues, I think, which encourages quite a deep level of introspection. Personally, I can't see it on the news without wondering what I'd do in that situation - either as a terminally ill patient or a close relative - and I suspect that's true for a lot of people. My hunch on assisted suicide (and it can only be a hunch) is that it's one of those issues where the law as it stands is lagging behind the moral zeitgeist. But really, for me, it's a question of personal freedom as much as anything - and that's how I wanted to frame it in the book. Society has a duty to care for the sick and vulnerable, but there has to be a place for individual choice and liberty within that context. You use humour to great effect in the book allowing the reader to bare some very intense scenes. Do you prefer writing humour or the more emotional passages? As a rule, I prefer writing humour because it provides a rhythm and structure that I'd otherwise miss. That said, I don't actually think of humour and emotion as distinct categories. Tragedy and comedy are more like two sides of the same coin. You can take almost any situation - no matter how horrific - and push it to a point where it becomes outrageously funny: the crucifixion scene at the end of The Life of Brian springs to mind. Then, by the same token, lots of comedy sails perilously close to tragic territory. There are scenes in The Office that have an almost unbearable level of pathos. The point, I think, is that when faced with extreme and unpleasant situations, laughter is as instinctual a response as tears. Kurt Vonnegut called laughter 'the soul seeking release', and I think that's spot on. There are some things in life that are so bleak that I can't imagine how any of us would deal with them without humour. I think it's a human quality that should be valued very highly. Will Alex's adventures with the universe and the law continue? In a word: no. The book was written as a stand-alone novel and I think the story wraps up exactly where it should. Alex can live the rest of his life off-stage. Are there any writers you'd cite as influences? Kurt Vonnegut, of course, but also John Irving, for similar reasons - the mixture of comedy and tragedy, humour and horror. A Prayer for Owen Meany had a big influence on my writing because it just has the most moving and perfect ending in literature. You know what's coming from the first page, but when you finally get there, it still hits you like a sledgehammer. Other than that, I'm also a big fan of Haruki Murakami - I love his style and his quirkiness - and I'm extremely envious of Vladimir Nabokov's linguistic ability and David Mitchell's incredible imagination.